York Academy students receive art instruction as part of the weekly curriculum cycle. 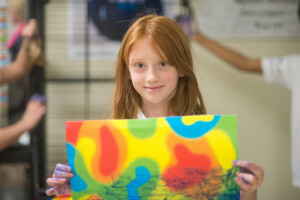 Art is integrated in an age-appropriate way into many aspects of the curriculum. Students incorporate a variety of techniques such as painting, mosaic and sculpture, while learning to express themselves in creative ways. Often art, music and other cultural curriculum components are taught together to create a rich educational experience.